There are many aspects to writing lyrics that may not immediately come to mind when you’re “in the zone” and the ideas are flowing. By all means, don’t stop the flow, just try not to get it hung up trying to find rhymes or correct phrasing at this point. Explore the “what if” ideas if anything and just let it roll. After that first draft, though, here are some things to consider. Getting trapped by precision. Writers who write exclusively lyrics and those who start songs by writing lyrics before writing melodies can suffer from getting into a lyric meter pattern in the first section they write and carrying the same pattern through every section. Those of you on the fringe’s of obsessive compulsive disorder are also going to tend to make sure that each lyric meter is precisely the same in each verse and even in the chorus. Consequently much of their lyric will feel forced, stiff and un-conversational. Remember, you’re not writing a Haiku poem here (precisely 17 syllables), you’re writing a conversation and seldom does a conversation come out precisely the same, verse after verse. I’ll hasten to add that there are certainly successful songs that are more “poetic” than others and not as conversational as they are artful. However, the artfulness is not as much about the precision of meter as choice of words, metaphors and images. In other words, not as much in the artifice as is in the content itself. The solution to this problem is to re-write what you think is a chorus with a totally fresh construction, lyric meter and rhyme scheme, making use of repetition of the title. Even if you’re not quite sure what you want the title to be and your initial draft of the song has the ‘”too precise and predictable” problem, always know that it’s a first draft and if the chorus is something you discover as you go, return to it for a rewrite before you nail down a melody. 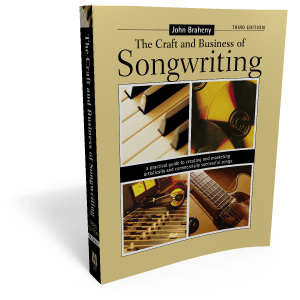 (See “Chorus Construction” P 93 The Craft and Business of Songwriting 3rd Ed.) For additional verses, loosen up. All you need is to make the vocal phrasing work smoothly with the first verse melody and if it means you need to make a slight adjustment in subsequent verse melodies to accommodate the lyric, it’s not really such a big deal. The content of the lyric is more important. This can be more difficult, however, if you write only lyrics without having a melody in your head to act as a matrix. Writing to express yourself vs. writing to communicate. Sometimes you DO communicate when you express yourself. The problem is mainly making it interesting to the listener. We’ve all had long conversations with people who want to talk to us about every nuance of their personal history or problems. At some point during an unstoppable interlude like that you find yourself thinking about whether your car is due for an oil change. However, some people are natural story-tellers who offer fascinating details, descriptions and build a story in a way that keeps you asking “Then what happened?” and you’re hanging onto every word. Chances are they’ve re-told the story (re-written it) enough times to have added a little fascinating detail along the way as they felt their listeners’ attention drifting. We never tire of hearing the same story and end up saying to friends, “Have him tell you the story about _____.” When you look at your lyric, try to put yourself in the place of a listener and imagine listening to this story. Would it hold your attention? Tell us the story. Don’t tell us about the story. The specific always stays with listeners longer than the general. (1) “She left me last year and I’m not over her yet. Interesting? No. Too general – not enough detail to be engaging. (2) “We fought about money, I could never make enough. Part of me’s glad the nagging’s gone and the other part knows I’m still in love”. So what did we gain? As a listener, I don’t really care when she left. I’m much more interested in why she left, and what there is about her, he can’t forget. So unless you begin to answer the question raised immediately, you’re courting boredom in your listener. Scenario 1 – Boy takes his girl home after a date – leans over to kiss her goodnight at her doorway and she turns her head away. Anyone who’s been there recognizes the major sign that something’s wrong. Scenario 2 – Boy is standing with four pals on the sidewalk after school. His girlfriend comes over to the group and the boy tries to kiss her. She turns away. The scene is much more intense because he’s also publicly embarrassed and now they all know something’s wrong. In scenario 2 the same action is intensified by a more emotionally loaded context. The drama is heightened considerably and sets up an even more volatile scene. Explore other contextual elements you could use to enhance the color and drama in your songs. Where is the action taking place? Who else is present? How do those factors relate to the action? It’s a good exercise to map out the scenarios in prose or like a movie script as I did above in as much detail as possible, describing what you see in your imagination, even if you don’t end up using all the details in your lyric. <!– /* Font Definitions */ @font-face font-family:"Times New Roman"; panose-1:0 2 2 6 3 5 4 5 2 3; mso-font-charset:0; mso-generic-font-family:auto; mso-font-pitch:variable; mso-font-signature:50331648 0 0 0 1 0;} /* Style Definitions */ p.MsoNormal, li.MsoNormal, div.MsoNormal mso-style-parent:""; margin:0in; margin-bottom:.0001pt; mso-pagination:widow-orphan; font-size:12.0pt; font-family:"Times New Roman";} table.MsoNormalTable mso-style-parent:""; font-size:10.0pt; font-family:"Times New Roman";} @page Section1 size:8.5in 11.0in; margin:1.0in 1.25in 1.0in 1.25in; mso-header-margin:.5in; mso-footer-margin:.5in; mso-paper-source:0;} div.Section1 page:Section1;} -There are many aspects to writing lyrics that may not immediately come to mind when you're "in the zone" and the ideas are flowing. By all means, don't stop the flow, just try not to get it hung up trying to find rhymes or correct phrasing at this point. Explore the “what if” ideas if anything and just let it roll. After that first draft, though, here are some things to consider.